If you're waiting for Sony to announce new high-end smartphones at CES 2018 later this month, you might be in for a disappointment. According to Georgian website Vortex.ge, Sony plans to unveil its first high-end handsets of the year a bit later, at MWC (February 26 - March 1). If that's true, Sony's CES 2018 press event will likely bring us just mid-range and lower-end phones like the recently leaked Xperia XA2, XA2 Ultra, and L2. Reportedly, Sony intends to showcase the following smartphones at MWC 2018: Xperia XZ1 Premium, Xperia XZ1 Plus, and Xperia XZ1s - all being upgrades over Sony's high-end handsets of 2017. As its name suggests, the Xperia XZ1 Premium should be the most advanced device among the new models. Similar to its predecessor (Xperia XZ Premium), the XZ1 Premium allegedly sports a 5.5-inch screen with 2160 x 3840 pixels (4K). But the phone should bring plenty of improvements, including a Qualcomm Snapdragon 845 processor, 6 GB of RAM, and 128 GB of storage space. What's more, the new handset reportedly has a 12 MP dual rear camera, and a fingerprint scanner on the back. It's said that the Xperia XZ1 Plus and Xperia XZ1s also feature rear fingerprint scanners and dual 12 MP cameras. But the XZ1 Plus should be bigger and more powerful, thanks to a 5.5-inch 1080p screen and a Snapdragon 845 processor, whereas the XZ1s reportedly sports a 5.2-inch 1080p screen and uses last year's Snapdragon 835 CPU. Both phones are expected to come with 4 GB of RAM and 64 GB of storage space. Announcing a new Xperia Premium at MWC 2018 makes sense, as the new device would come one year after the Xperia XZ Premium (unveiled at MWC 2017). As you may have noticed, there's no mention of any Xperia XZ2, though Sony could save this name for its high-end phones scheduled to be introduced in the second half of the year. 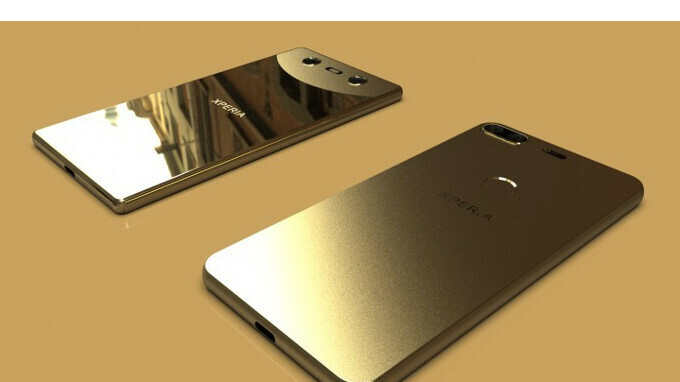 Not long ago, we've stumbled upon a couple of renders allegedly revealing the designs of two upcoming high-end Xperia phones (pictured above), both sporting screens with thin bezels. It remains to be seen if the Xperia XZ1 Premium, XZ1 Plus, or XZ1s resemble any of these two handsets. That's a fake insider iPhone arena. Are you too blind to notice? Sony be like, 'we were wrong rounded corners and small bezel is the way to go'. Renders afaik. But still, they really need to come to their senses. They (& several others) could have taken the phone world by storm had they gotten serious about eradicating bezels 3-4 years ago. Cannot believe the secondary players sat around with the thumbs up their #%^&* for so long. We've been fantasizing about this for a decade now. @Florin T, You guys need to more careful about which report you decided to post. It's a well known fact that vortex.ge is a sham site. Please don't go posting something from a sham site and don't give him the shoutout the site deserve. The guy who owns the site use info from other site and claim this is exclusive info only available to vortex.ge. That guy is a crook. If you want Most of the reliable info about sony phone you go to esato.com. Isn't that what PA does too? I'll take the xperia ultra 2 with dual speakers, please. If the new Sony phones actually look like one of those pictured, sign me up for one. Slim bezels at long last! It was about time, Sony! The XZ Premium I believe it has a 5.7 inch display, not a 5.5 inch. 5.5 inch is getting small these days, since many companies have devices with 5.7, or 5.8 inches. The Premium of course, the regular XZ is smaller than the Premium version, and only the Premium version have 4K display. You mean the successor of the xz premium cause the xz premium is already here and it has a 5.5inch screen. You said "The XZ Premium I believe it has a 5.7 inch display, not a 5.5 inch." I have no idea if it is real or not. But I remember 3 models with code H8xxx were found. H81xx, H83xx and H82xx. In 2017 , high end were G81XX, G82XX, G83XX and G84XX ( compact). If the FPS is moved on the back - will not buy more Sony phone. Till now was excellent to have side FPS. Most convenient place for me. Also the right render had too much iPhone ugly camera hump. Not my taste. Hope FPS to stay side mounted and bigger battery. I don't care about the bezels. In landscape mode, as usually I watch my videos, I need place to hold the phone. If it is all screen is inconvenient for me. Will wait and see. Sony model names are so confusing. I saw my friends have put their iPhone X inside the microwave for about 2 hours with 200 to 500 degree celcius to wirelessly charging their new iPhone X and guess what, it is really working. Their iphone X no need to have a wireless charging deck or pad. That's how I felt when reading this article on phonearena. Dual cameras and finger print looks like one plus 5T?! The back material (except top swipe) looks a lot like the Essentials Phone to me.